Over the last 12 months, Frese has created an impressive body of images that draw upon the history and people who inhabited the plantation for almost two centuries. Faces of long dead members of the Weeks family who owned the Shadows, their clothing, household objects, personal letters, and the belongings of slaves who worked the land move in and out of her collages like specters in a dream. 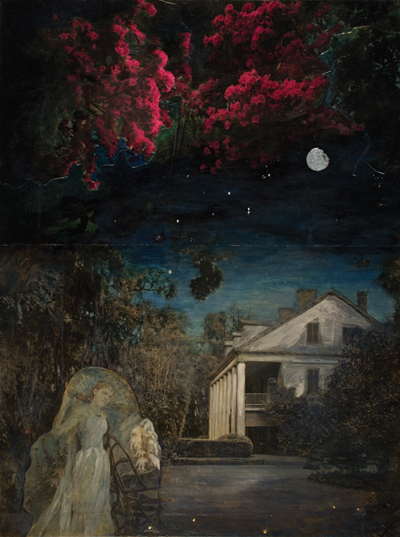 Each hand-tinted collage is an impression of time, place, and the tragic and complex relationships between the people who once lived and worked in this elegant historical home on Bayou Teche. They are silent stories left to the imagination of viewers. The project, titled "Art and Shadows," funded in June 2014 by the National Trust for Historic Preservation and the National Endowment for the Arts, has enabled Frese to spend an entire year as an artist-in-residence at the Shadows where she has set up a small studio overlooking lovely gardens and massive live oaks. With keys to the entire house, she moves freely from room to room where stern portraits of long ago family members gaze at her intrusion. She often climbs the steep narrow steps into the attic to spend time among centuries-old books, Weeks family archives, clothing, furniture and household objects. Alone and in complete silence, she thumbs through long, loving and beautifully written letters between husbands, who were away for weeks at a time tending to business, and wives who remained at home to run the plantation. In these letters and archives, she finds expressions and objects that she later works into her visual stories. Like so many other artists who come to South Louisiana from other places in the country, Frese has taken to the state’s Acadian culture with the ferocity of a Cajun fiddle player at a Saturday night dance. Born in Florida, raised in Rhode Island and educated in California, she arrived in Louisiana in 1986 to teach fine art photography at the University of Louisiana at Lafayette. “I thought I’d be here a short time and then move on,” says Frese, who now holds an endowed chair at the university. “But Louisiana got me, and I stayed. I like the climate here. The weather is so dramatic with the storms and wetness. I also love the music and the Francophone culture and language. There’s a certain kind of worldliness about Louisiana that appeals to me. It certainly has influenced my work. There’s also a kind of pagan lust of living on and off the land here. The fierce and staunch pride Cajuns have for their culture is appealing, and so is their joie de vivre of having fun.” Frese, fluent in French, lives in the heart of that culture in Breaux Bridge just a few blocks from Bayou Teche. As Faulkner wrote – “The past is never dead. It’s not even past.” It remains in the Shadows and in Lynda Frese’s images. "Art and Shadows" will be on view at the Shadows visitor center from May 9 through Labor Day. For additional information about Frese and her work, visit lyndafrese.com.